Family game nights are a great tradition to start with your family! Are you ready to fill your house with some family friendly fun! Out of the Box Games will help you do that! 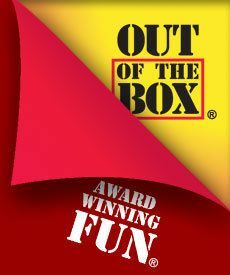 You'll want to establish family game night in your house with the fun games available from Out of the Box Games. I was excited to be selected to review Snake Oil with my family in our home. Get ready for some family fun and lots of laughs! 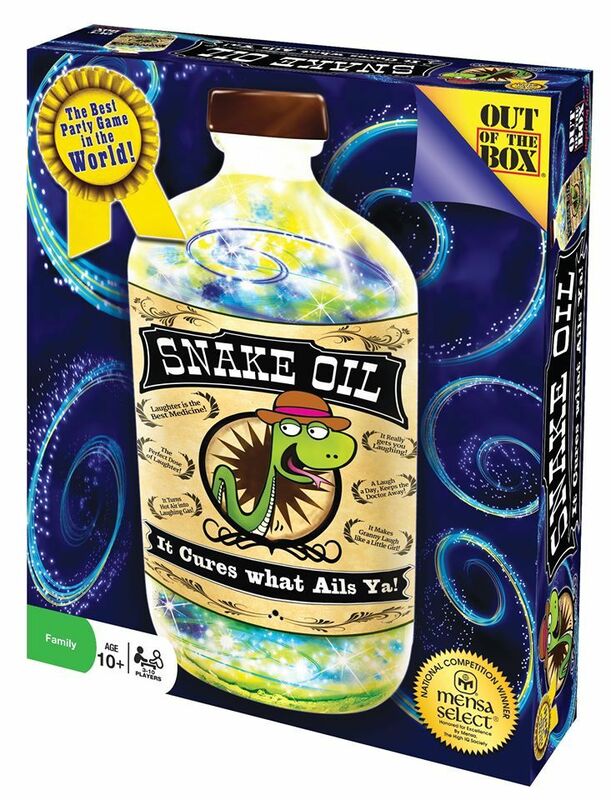 Snake Oil is best for ages 10 and up. At $19.99, it's a box full of fun for the entire family! There are four Word Card decks that you'll place on your playing table. The Word cards are purple with rounded corners. Be sure the cards are within reach of all the players. Each player gets to draw a hand of six Word Cards. Choose one player that will get to be the Customer for the first round. The Customer will take a Customer Card (green in color), and choosing either side, will read it aloud and take on the role that they read from the Customer Card. They'll lay their Customer Card down on the table in front of himself or herself for that round. The other players will create an item for the Customer by combining two Word Cards from their hands. Each player, when ready, will make their "pitch" of their item to the Customer. When one player is finished pitching their item any other player is allowed to jump in and make their pitch. Pitches that go over 30 seconds can be cut off by another player. After each player has made their pitch, the Customer will then pick the best item and award the Customer Card to the player who created the winning item. Players are to place the Word Cards they used in that round back into the card tray and draw new Word Cards from any of the Word Card decks to bring their total count of Word Cards back up to six. The player to the left of the first player to be the Customer will become the Customer in the next round. The game continues as stated above until all players have gotten the chance to be the Customer. Once everyone has had their chance of being the Customer, the player with the most Customer Cards is the winner of the game! 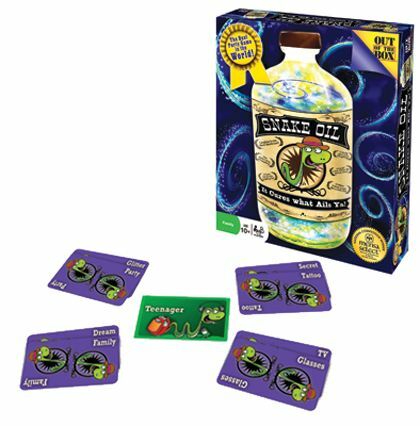 Snake Oil has become one of our most favorite family games to play together! We enjoyed tons of laughs during our family game nights with Snake Oil. The memories we've made together as a family mean a lot to this momma's heart. I want to create family traditions that my kids will remember when they're older and will even make into traditions with their own children one day. You can follow Out of the Box Games on the following social media outlets: Facebook, Twitter, and YouTube. Read more Out of the Box reviews from the Schoolhouse Review Crew by clicking on the image below!